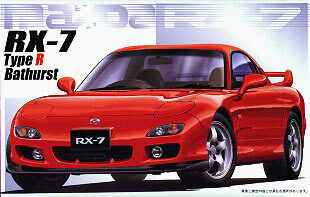 It took Fujimi quite a long time before they did a 3rd gen RX-7 kit, but the results were worth the wait. 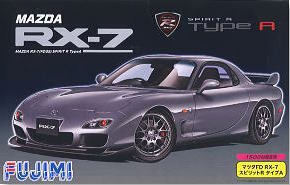 Fujimi sofar did no less than seven different body styles, including the 2002 model in its top-specs Spirit R Type A version. The other bodies are a model '99 RS, an unmodified '96 (I think: its nose is slightly changed from the '92-'95 models, but it still has the rectangular tail lights), a '96 with a Mazdaspeed A-Spec front spoiler and aerokit a version with separate parts for front and rear bumpers and a separate bonnet and the latest RE Amemiya wide body. 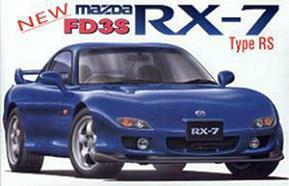 The Fujimi FD3S kits are curbside kits, but chassis and cabin interior are well detailed. As Mazda only sold the full-size late-model RX-7's in Japan, Fujimi only includes a RHD dashboard and luggage bins instead of rear seats. 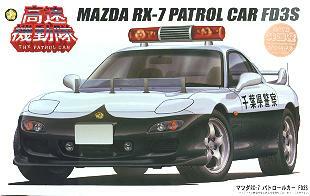 I have put the Mazda (factory) FD3S versions on this page and moved the Tuner and anime versions to a separate page. I have added a list of links to websites of car tuners mentioned in the text at the end of this page. Links in the text refer to this list. This RS version comes with lightweight bucket seats, new 5-spoke alloy wheels with the latest type Pirelli P Zero tires and a big rear wing that make the RS model stand out among earlier or lower specced FD3 RX-7 versions. There are nice cross-drilled brake discs visible behind the wheels and a decal set with badges, dials and the center console face. An add-on aerokit is also included, as is an optional dual-aerofoil rear spoiler. The tail light clusters are of the correct type with circular lights behind a clear cover. Note that the '99 RS rear spoiler differs from the one in the '96 kits. There are some useful detail pics of a real '99 RS on the side of the box. Chassis parts are molded in black, body, aerokit and interior are molded in an electric blue shade that looks close to the 'Innocent Blue' color of the real 1999 RX-7. Later releases of this kit came with very nice Dunlop Denloc D40 tires. Just like its box art, this kit is almost identical to the ID-36 kit, but comes with additional parts for lowered suspension. The new strut/brake assemblies are 2mm lower than the original ones. Of note is that the brake disks on the lowered parts are not cross-drilled and the springs are wound the other way round on all four struts. Stub axles are now molded in with the rear suspension assemblies, this is done in such a way that the rear wheels no longer rotate. Apart from the extra suspension parts, the wheels are now in dark metallic gray plastic, instead of aluminum plated and the body, aerokit and interior parts are now molded in white. For the 2015 rerelease of the ID-36 kit Fujimi threw in some extra goodies: optional parts for lowered suspension and a set of self adhesive masks to ease painting the black border on the insides of the windows. The optional suspension parts (S-parts tree) are identical to those in the Suspension Down 5 kit, the instructions offer a choice between the stock suspension and the lowered parts. Chassis parts are molded in black, lowered suspension parts are molded in gray, body, aerokit and interior are molded in blue and the wheels are painted satin aluminum, tires are now Bridgestone RE71. This kit is identical to the regular Mazda FD3S RS '99 kit listed above, except for the wheels and tires which are replaced by 18in RE Amemiya AW7 wheels fitted with Bridgestone Potenza RE711 tires. These wheels are also sold separately. Body and interior parts are molded in blue, chassis parts are molded in black. This kit is identical to the Tohge Mazda FD3S RS '99 kit listed above, with a small set of decals for white stripes added. Don't let the 'USA Custom' title put you on the wrong foot: there's no lefthand drive dashboard nor any other USA related item included apart from the Dodge-style striping decals. Although 'Type RS' is not mentioned on the box, the RS aerokit parts are included. Body and interior parts are molded in blue, chassis parts are molded in black. 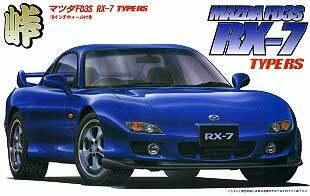 Fujimi created this kit of the 2001 lightweight RX-7 RZ model in time to coincide with the release by Mazda of the real RZ model. The kit is based on the excellent '99 FD3S RS kit. The kit comes with new racing-style seats, a new steering wheel and a set of metallic gray 18in BBS-LM wheels fitted with the latest style Bridgestone Potenza RE711 tires (Note that Mazda fits 17in BBS wheels to the RZ). The decal set includes the latest black-on-white instrument dials and the red 'RZ' markings for the B-pillars. The kits body is identical to the '99 RS, so the fog lights in the brake cooling intakes need to be removed. Body and interior parts are molded in white, seats are molded in red and chassis parts are molded in black. I composed the picture on the right from pictures found on the Mazda Japan website to show what the real RZ looks like, a view of the dashboard and pictures of the interior can be found on a separate page. The production run was ended after 175 RZ types were produced, the Mazda Japan website no longer has info on the RZ, some more pictures can be found on this page. Fujimi released this special limited issue RX-7 kit at the same time as the real Type R in limited edition 'Bathurst R' version was released. The kit is once again based on their excellent '99 FD3S RS kit. The kit differs only slightly from the '99 RS kit: it does not come with the RS-type side skirts (D-parts) and the fog lights have to be removed from the brake cooling intakes. The decal set includes the latest black-on-white instrument dials and the 'Bathurst R' markings for the B-pillars. 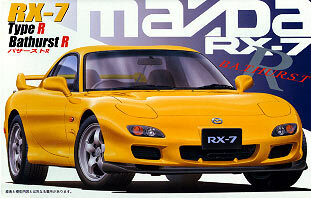 Body and interior parts are molded in a shade of yellow close to Mazda's 'Sunburst Yellow'. Chassis parts are molded in black. This Bathurst R edition was continued into the 2002 model year. I composed the picture on the right from images found on the Mazda Japan website, a view of the dashboard can be found on a separate page. The Mazda Japan website no longer has info on the Type R 'Bathurst R' limited edition, some more pictures can be found on this page. This is a limited issue of the Type R 'Bathurst'. Differences between this and the 'Bathurst R' kit are limited to a new decal sheet with 'RX-7' dealer plates and without 'Bathurst R' markings for the B-pillars. The fog lights in the brake cooling intakes should be retained for this regular 'Bathurst' version. Body and interior parts are molded in red. Chassis parts are molded in black. The 'Spirit R' is the final version of the FD RX-7, edition will be limited to 1500 cars, in three versions Type A, B and C with the Type A being the ultimate RX-7, the fastest ever produced by Mazda. 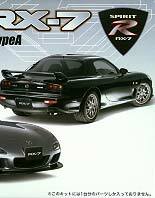 This limited edition kit is similar to the RX-7 Type RZ 2001 kit, the only differences are a new set of decals with additional rotary shaped 'Spirit R' emblems and the colors of the parts. New interior tub now has storage bins instead of rear seats. The box art shows some pictures of a full size 'Spirit R' Type A in Titanium gray Metallic color. Wheels are metallic gray 18in BBS LM wheels with Bridgestone Potenza RE711 tires. Body and interior are molded in black with a slight metallic effect (too dark to resemble the Titanium Gray paint) chassis is molded in plain black, seats and steering wheel are molded in red. 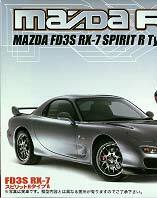 More info on the 'Spirit R' can be found on this copy of the official Mazda announcement. 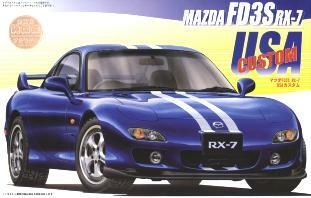 This is a special limited edition of the Spirit R kit to commemorate the end of RX-7 FD production. 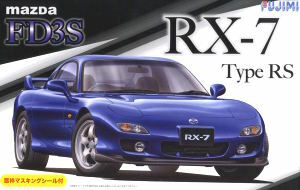 A cardboard reprint of the VIN plate of the last RX-7 FD produced (a Titanium Gray Spirit R type A) is included in the box, otherwise this kit is identical to the regular 'Spirit R' kit. A shiny golden sticker on the edges of the box sets this special limited edition apart from the regular box. 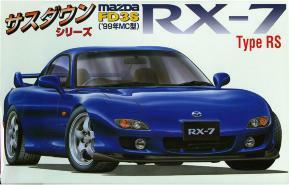 Almost five years after production of the real RX-7 FD ended, Fujimi have added their Spirit R version to the regular Inch Up Disk series. The kit is identical to the first Spirit R kit as are the decals and the colors of the parts. On the box is a note that only 1500 were made, but this applies to the real car, not to this model kit ! 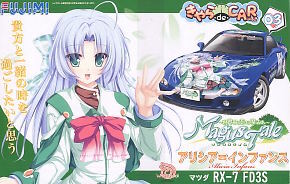 This kit is basically similar to the Type RS '99 kit with a large additional set of decals for the 'Magus Tale' Itasha graphics added. There are many additional items on the Itasha decals for doing your own variation or for dressing up the interior. Body and interior are molded in dark blue, chassis parts are molded in black, wheels are aluminum plated. 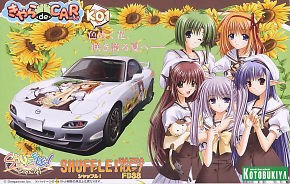 It looks like it is Kotobukiya's turn to sell a couple of Itasha cars based on Fujimi kits. This kit is branded as a Kotobukiya kit, but it contains a Fujimi 2001 Type RZ kit with a large additional set of decals for the 'Shuffle !' Itasha graphics added. As usual there are many additional items on the Itasha decals for doing your own variation or for dressing up the interior. Body and interior are molded in white, seats are molded in red, chassis parts are molded in black, wheels are aluminum plated. This kit is basically similar to the yellow Bathurst R kit with an additional set of police car parts. The police parts consist of a transparent debris shield, transparent red parts for the lightbar, front signal lights and a traffic control wand, brightly plated parts for the lightbar and a set of white parts containing radio equipment, radar equipment, traffic cones, a policeman's helmet, a pair of handcuffs and a ticket book. The usual spare parts are included as well, including big bore exhaust tips and a dual aerofoil wing, so you could turn this kit into a pretty mean cop car. The kit contains two sets of decals, one is identical to the set in the '99 FD3S RS kit, the other one is new and offers police badges, license plates and prefecture names. No decal is provided for the curved black patch on the nose. Body and interior are molded in white, chassis parts are molded in black, wheels are aluminum plated. Please note that the following links point to pages written in Japanese. A crude but easy way to translate Japanese web pages is by using Google or a similar free online translation engine. 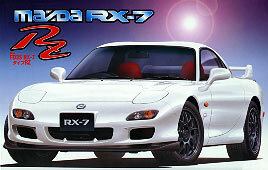 Some more Fujimi FD3S RX-7's and links to tuner websites can be found on my Fujimi Tuned RX-7 FD3S page . If you are looking to buy RX-7 aftermarket parts, try places like IM Racing.